ABOVE: Bridges of Paris is a large-format book with more than 350 color photos of Paris and its 37 bridges, plus descriptions of the individual bridges and their histories. 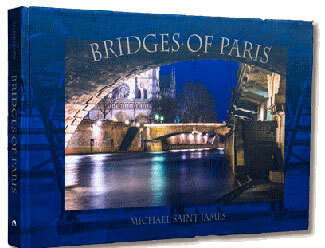 If you're looking for a coffeetable book to present as a gift or keep as a souvenir, you're unlikely to go wrong with The Bridges of Paris by Michael Saint James. "Living as a Parisian for a year in a fifth-floor walkup apartment, photojournalist Michael Saint James left his American lifestyle behind and spent his days and nights capturing images from over, on, beside, and under the bridges of Paris. With over 30 years' experience as a photographer, educator, and world traveler, Saint James immersed himself in French culture to search out his authentic artist soul and bring back a treasure to share. The result is a visual feast and the intimate story of the world's most romantic city." Island Bridges, such as the Pont Neuf and the Pont Saint-Michel. Palace Bridges, such as the Pont des Arts, the Pont Royal, and the Pont de l'Alma. Downstream Bridges, including Pont de Grenelle and the Pont de Bir-Hakeim. Upstream Bridges, including the Pont de Bercy, the Passerelle Simone-de-Beauvoir, and the Viaduc d'Austerlitz. Each of the 37 bridges has several pages of photos, along with an introduction that describes the bridge and its history. What's more, the photos aren't static, boring architectural shots: Some are dramatic two-page spreads with nearby landmarks, some show details that Parisians and visitors often miss, and others are "people shots" that capture the ambiance of the bridges and their surrounding neighborhoods. As a bonus, The Bridges of Paris includes a personal introduction ("A Photographer's Perspective"), maps of Paris, and a bibliography. You can order the book directly from the publisher, from Amazon, or through your local bookseller. (When we last checked, the publisher's bookstore offered free shipping to buyers in the USA, Canada, France, UK, Ireland, and Australia.) List price is US $85.00, and the ISBN is 978-1-928595-50-2. For more information about The Bridges of Paris and its author, visit the book's official Web site at www.bridgesofparis.com.